Cakes by Robin can create dainty cupcakes for both baby boys and baby girls for all types of celebrations and events. 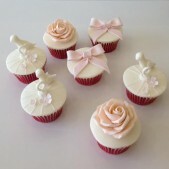 If you are planning a babyshower, christening, naming ceremony or baby's birthday, get in touch to order some cupcakes. 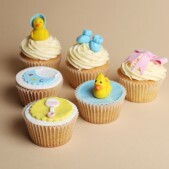 Celebrate the birth of the new arrival with our baby themed ranges including cupcakes, cakes, cookies and cake pops. Our cupcakes are wonderfully miniature in size with all the taste of any of our cakes, baby cupcakes are thoughtful and unique gifts to celebrate a new life. 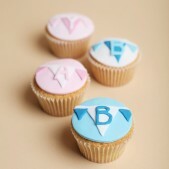 Our miniature treats can be ordered for a range of baby events such as baby shower parties or your baby’s christening. 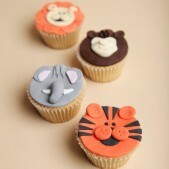 Our baby cupcakes prices start from £2.50 each or £3.50 with sugar decoration. We can also create individual miniature baby-themed cakes priced at £9.95 each. Our cakes can follow any theme you have and will be perfect accompaniments to your cupcakes, cookies or cake pops. If you are planning a baby shower or christening get in touch with Cakes by Robin to find out more about how we can put together a tasty collection of cake based treats for your event. Your order of baby cupcakes can be delivered free of charge to you in and around the London area or you are welcome to collect them from our cake studio. Our baby cupcakes can be packaged in individual boxes and decorated with a special baby decorative ribbon or presented together in one larger box.